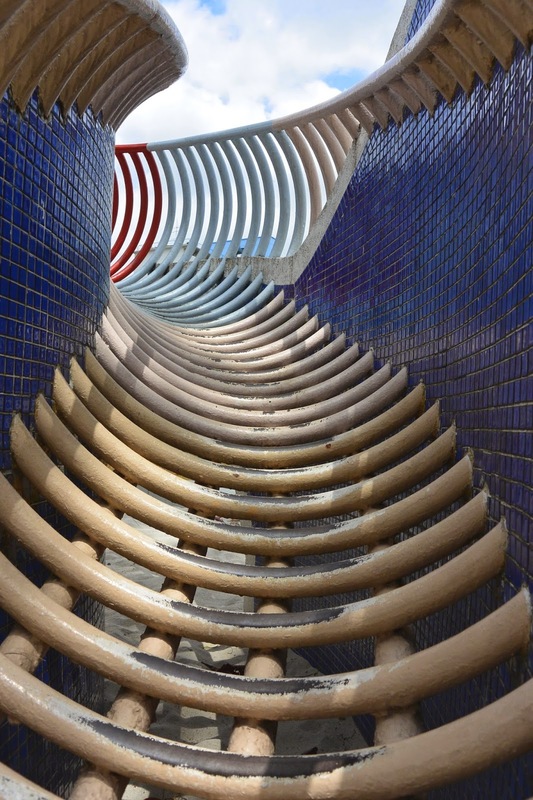 Tails from the Lion City: Mosaic Playgrounds of Singapore. 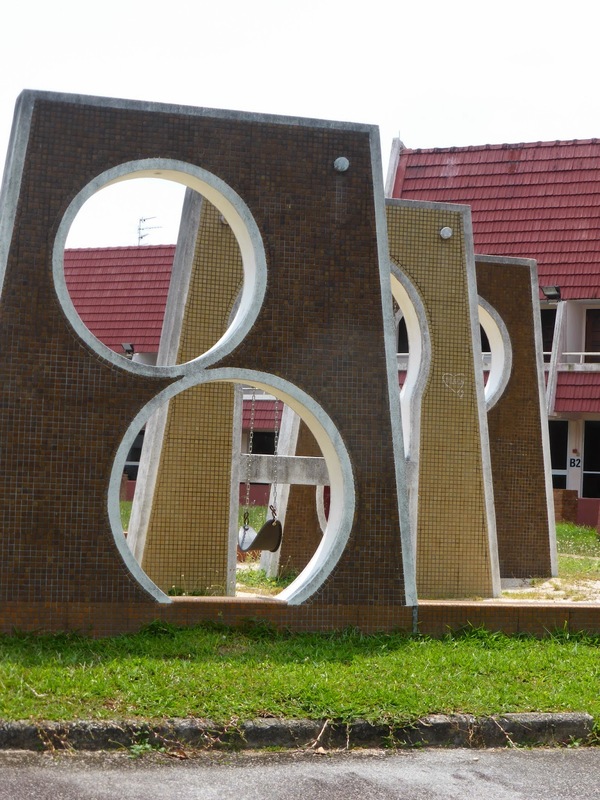 With the building of HDBs, as the old kampong villages were demolished for concrete villages in the skies in the 1970s, they were designed with playgrounds for the children to enjoy and let their imaginations run free, where their actually bodies could no longer do so with such ease. 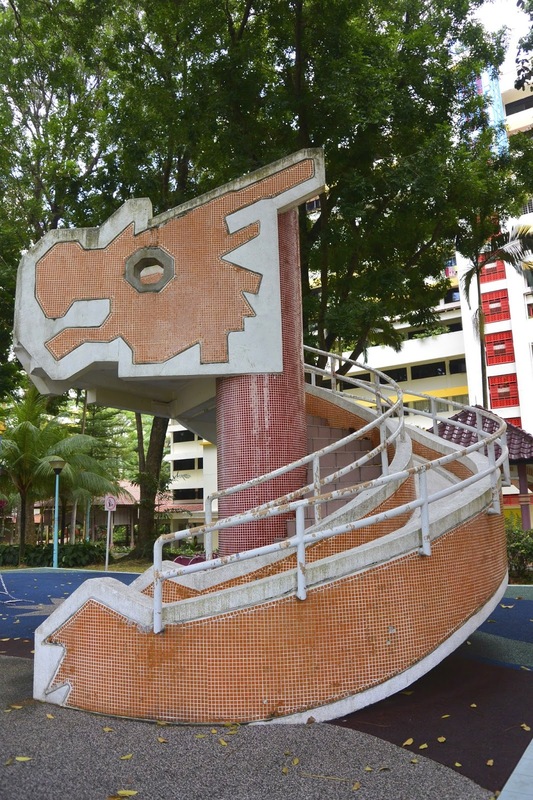 The early playgrounds were quite utilitarian however, in 1974 the Housing Development Boards introduced new designs to help form and secure the Singaporean identity. 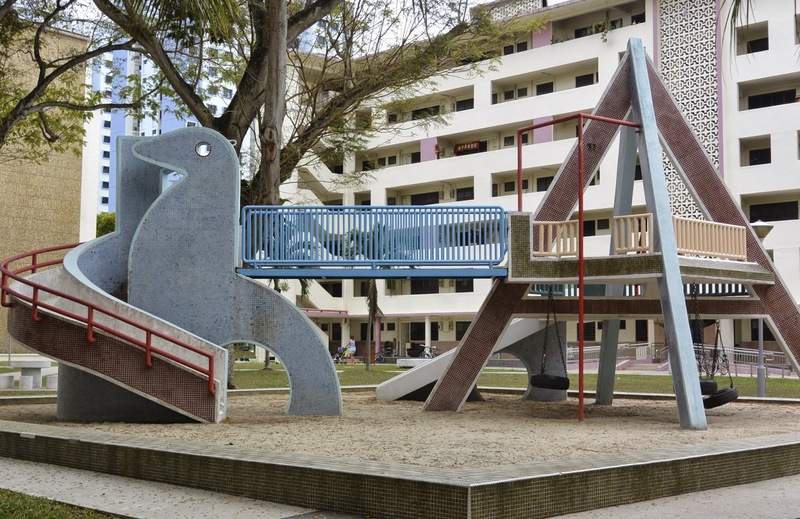 The most iconic and well know design, as mentioned, were the dragons (1979) and these were designed by a HDB landscape designer named Mr Khor Ean Ghee. In total he created over 30 of these playground designs. A big thanks to this gentleman who through his designs has kept me busy for many a week as we traversed the island in search of children's memories. Come the 1980s nursery rhyme themed playgrounds were introduced with rabbits, tortoises etc and then fruit, watermelon, mangosteen and more. Then there were the Singapore heritage themed builds, kelongs, trishaws and bum boats. 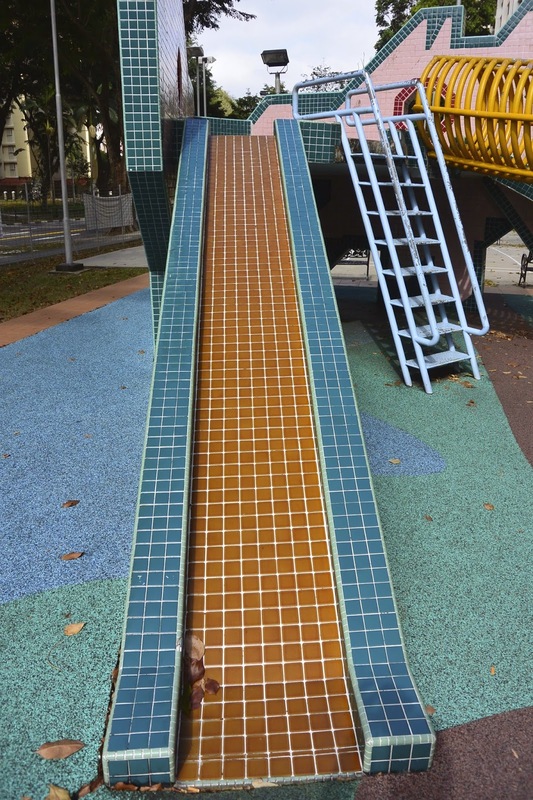 Mr Koh worked for HDB from 1969 until the 1980s In 1988 there were new generations of playground designs, the nuresry rhymes themes - clocks, old lady who lived in a shoe, fire engines and even Humpty Dumpty. By 1993 sadly no more of these homegrown mosaic playgrounds were built, as new constructions were many from plastic and metal and imported from overseas, a generic pattern that we can see all over the world. Sadly many of these playgrounds have been demolished either for new housing developments, roads or replaced by modern metal and plastic equivalents. Initially we heard about the dragon playgrounds that have become somewhat famous here, with replicas popping up all over the island, Sentosa and even as a lantern in this years River Hong Bao festival. Many locals we spoke to either thought they had disappeared completely or that just one dragon remained, but after researching we discovered 4 still remained, so we set out to track these down. On the way we discovered other characters that remained so the task grew. 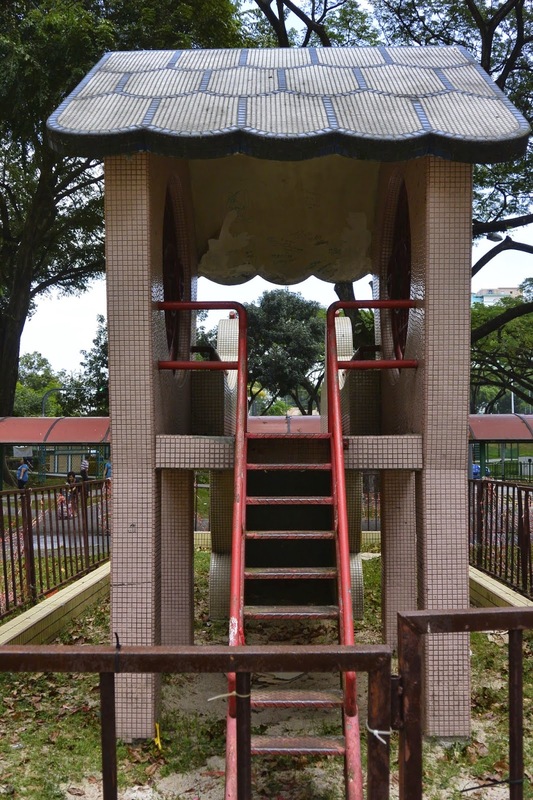 Some of our Singaporean friends have revisited these with their children, which I love to hear about and others have told us of their memories of playgrounds now vanished, as well as a few photos of themselves in times past. Now below are listed those that we have found, in various states of repair. Who knows if there are more out there? Please let us know! These were introduced in 1979 as as apart of the 'Adventureland' playgrounds. A series of 5 different themes playgrounds which also included the dove and the metal cage, not sure which the other 2 were? Block 57 Pipit Rd. This was the first dragon discovered and quite by chance as we were actually at the address to take photos of the Van Gogh void deck art gallery http://www.singaporetales.co.uk/2015/02/void-deck-art-social-creatives.html but as we rounded a corner of the HDB we came face to face with a dragon! A doubly successful day as we knew we were planning to dragon hunting. Ang Mo Kio Ave 3 a very short walk from the Ang Mo Kio MRT. This is a much larger dragon, but as with the Pipit rd one, the old sand pit it once sat in has been replaced with rubber tarmac. Toa Payoh, Lorong 1, Block 240. This one again just a short couple of minutes from Braddell MRT. Another small dragon like that of Pipit Rd but what I liked about this one was, that next to it sits a modern metal and plastic climbing frame/slide. It was good to see the old sitting alongside the new and still much in use. Designed in 1988 to represent children nursery rhymes. 176 Boon Lay Ave. The first clock we spotted was purely by chance as we passed by on the bus and saw a rainbow decorated HDB. We quickly rang the bell and hopped off to investigate and guess what right next door was our first Clock mosaic playground. This one sadly neglected and cordoned off. Clearly this hadn't been used in a long time, it stood sadly in its original sand pit, which was overgrown with grass and weeds. A sad sight, clearly unloved, with a much newer, shiny and larger playground next to the Block next door. I wonder at the fate of this clock. I hope someone appreciates it and lets it live on. Bishan St 13. Block 514C. Right next to the MRT. 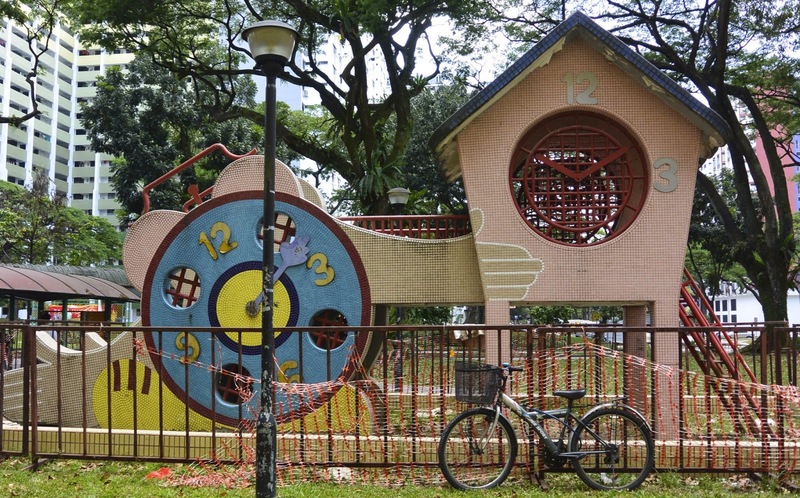 Now this clock playground couldn't be any more different to the forlorn unloved one of Boon Lay. Here this one sprightly sits next to the food centre by the entrance to the MRT. Again still with its original sand pit however this one is spotless and shiny. The sand is swept and raked daily and it smiles happily on as the children play on it. Indeed we even tried this one out! Mangosteen. Just a short few feet away from the watermelon sits these two fun mangosteens, some of my favourite fruit. Hubby works very close by and he has Singaporean friends that live very close to here as well and yet they knew nothing of these playgrounds. It was interesting to see the graffiti inside the fruits - very un-Singaporean! Dove. Block 10 Dakota Crescent. These are just a 15 minute walk from home but until recently I never knew these were here. Hidden away in the vintage Dakota Crescent where much will be demolished after 2016. What will happen to the doves? will these disappear too? surely perhaps they could be moved and placed elsewhere, saving them for the next generation of children that will grow up in the shiny new apartments that will replace this lovely community. 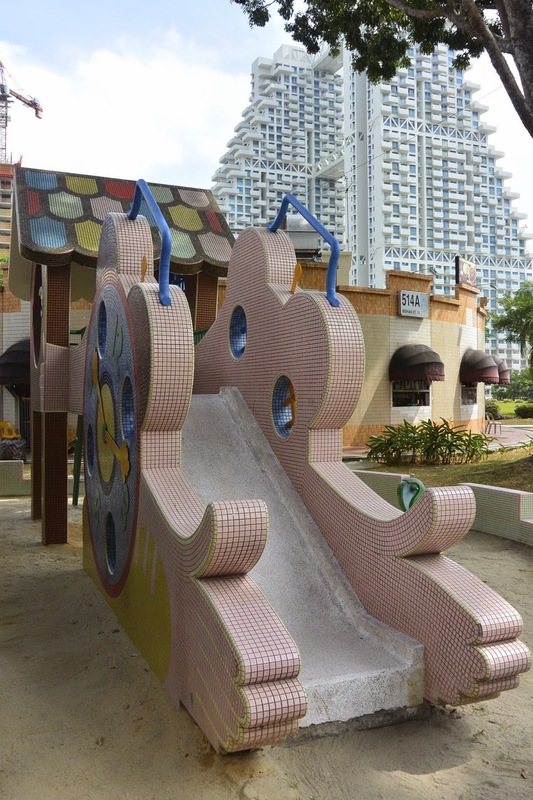 This was one of the 5 'adventure land' playgrounds introduced in 1979 which also included the 'metal cage' in Tanjong Pagar. Love the tyre swings still very much in use, A thing I remember from my childhood, and also falling bottom first through the tyre, or getting wedged inside them! Inside the NS Home Team Chalet at No. 125A Pasir Ris Road. The elephant trunk is a slide! He we had to go slightly off piste to track this elephant down in his jungle home. Sadly 3 of the other animal playgrounds were demolished. You will no longer be able to play and slide on the former Pelican, Rabbit or Tortoise as they were demolished in 2012. Only living on in photos and "big kids" memories. 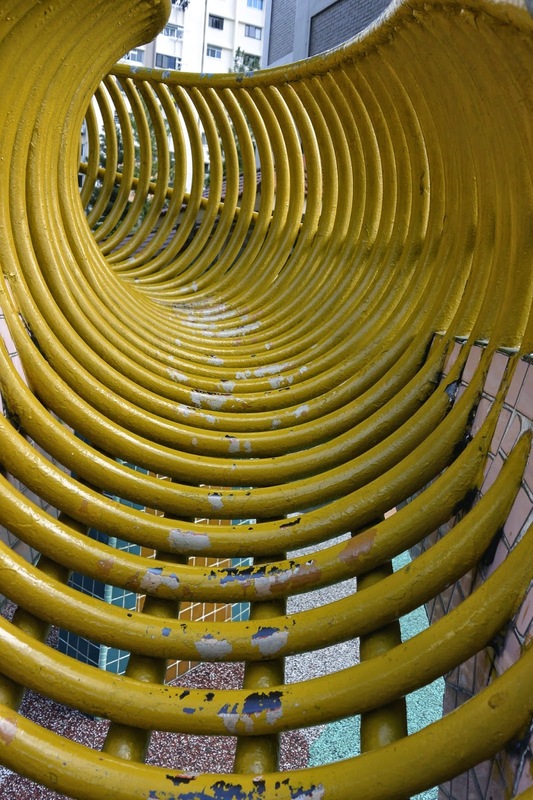 These had been the earliest of the these mosaic playgrounds built in 1974. Bumboat. Elias Rd Block 623. Last but by no means least we travelled to Pasir Ris for this sampan/bumboat, a somewhat different feel to those of the others I felt. 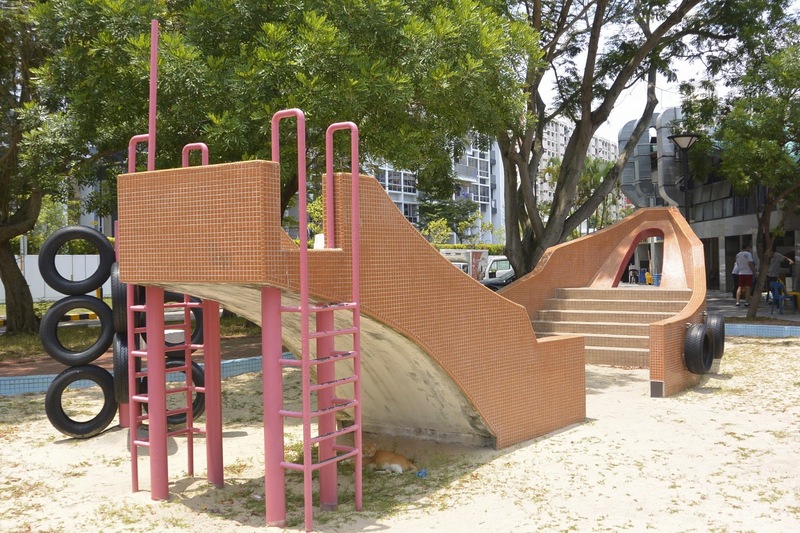 We have also found dinosaur playground at Toa Payoh but these aren't mosaic, and we've heard of older playgrounds apparently in Woodlands which are again of dinosaurs and a kampong village, so will hopefully be taking a look soon. 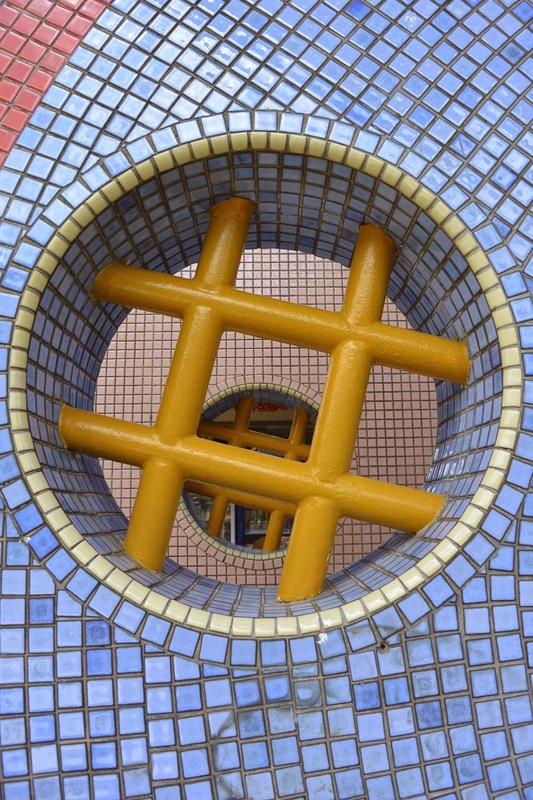 Now these are the only mosaic playground we have still found in existence, if anyone please knows of any more please let me know.